The 2010 Luce della Vite Brunello di Montalcino is a dark and impenetrable wine that oozes intensity and impressive opulence. This is one of those Brunello wines that takes Sangiovese to the outer limits of concentration at the outer edge of space and then flings it back down to us earthlings to enjoy. Given the softness and the textural richness, it's safe to predict that this wine will drink well in both the near and long term. It has that unique aging flexibility. Only the tannins, mostly oak tannins by the taste of them, need additional softening and finessing that should occur with extra cellar aging. There's a touch of bitter astringency as well that is distracting. By the taste of it, the 2010 Luce is the biggest and most extracted Brunello in 2010. 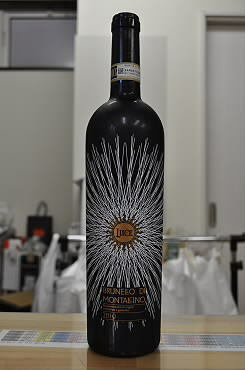 Luce della Vite’s 2008 Brunello di Montalcino Luce is one of the most powerful wines of the vintage. Mocha, espresso, licorice, smoke, super-ripe black cherries and plums literally jump from the glass. A Brunello seemingly made for Napa Valley Cabernet drinkers, the 2008 has plenty of richness and depth. It is also impeccably made from a technical standpoint, even if it bears little resemblance to the rest of the wines of the appellation. Anticipated maturity: 2013-2020. The 2006 Luce della Vite (55% Merlot, 45% Sangiovese) is one of the finest vintages of this wine I can recall. A big, full bodied wine, the 2006 Luce della Vite flows with super-ripe blackberries, blueberries, spices, minerals in a style that deftly balances sumptuous concentration with the clarity and vibrancy that is the hallmark of this vintage. Anticipated maturity: 2011-2021. The 2009 Lucente is an attractive, juicy wine loaded with dark red fruit, licorice, leather and smoke. It shows good balance in a supple, forward style ideal for near-term drinking. La Vite Lucente is 75% Merlot and 25% Sangiovese. Anticipated maturity: 2012-2017.